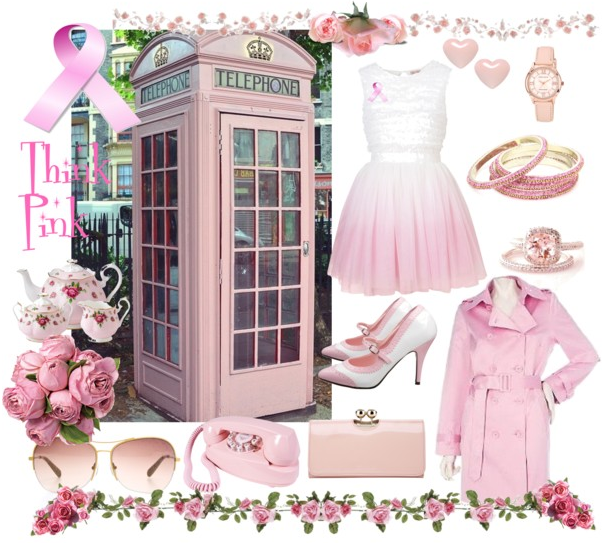 POLYVORE SETS…October is breast cancer awareness month! As you all know, Ciarra and I just love playing on Polyvore. It is a fun and creative way to come up with new ways to style outfits, or even be inspired to make a new one for yourself. Many people have made beautiful pink sets to spread the word for breast cancer awareness. My Grandmother “Gina” (look at my past posts to see her. She is the one who inspired a lot of what I do) Was a breast cancer survivor. My cousin is also a survivor.Unfortunately, there are many out there who have fallen and passed from this earth due to breast cancer. It is up to all of us to spread the word to get regular check ups, DO NOT be afraid to get a mammogram (I have had more than one, and it is not bad!) and check your breasts on a regular basis. MEN can also get this disease, so if you are a male, don’t think you are in the clear here. It does happen! For all the women, men and children out there who have been subjected to this devastating disease, We dedicate our set to all of you. Remember to THINK PINK!!! wear pink this month, or don your pink ribbons for everyone out there! !